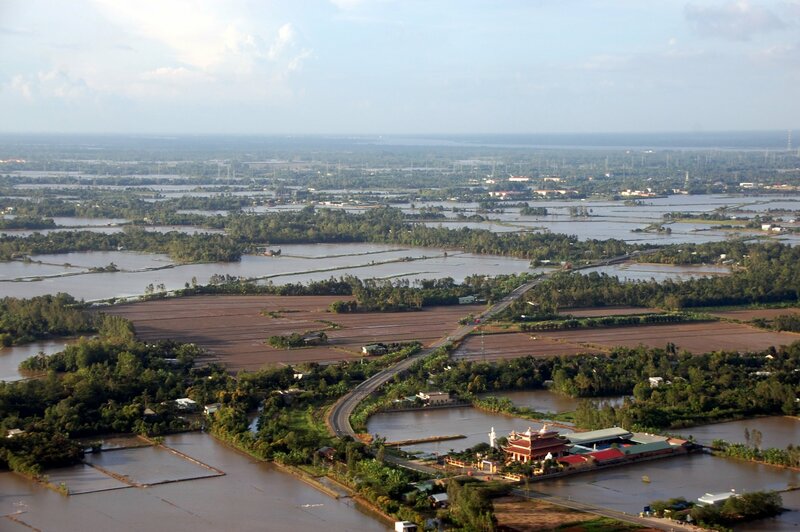 Due to sea-level rise, salt water can intrude 30 to 40 kilometres inland, followed by high water levels in the riverbeds and increased sedimentation in canals and flooded plains. Photo: Trond Rafoss. Coastal countries are highly prone to sea-level rise, which leads to salt-water intrusion and increased salinity levels in agricultural land. Also typical for these regions are floods and waterlogging caused by cyclones and typhoons, as well as prolonged drought periods. All these climate related issues play a major role in rendering agriculture in these areas, rice production in particular, increasingly difficult. According to the World Bank, salinity issues in Bangladesh will most likely lead to significant shortages of drinking water and irrigation by 2050. It is also estimated that increased soil salinity, both in coastal and inland areas, may result in a decline in rice yield by 15.6 percent, thus reducing the income of the affected farmers significantly. The situation is similar in Vietnam where coastal areas are already suffering from sea-level rise and saline intrusion. Vietnam also experiences strong storm surges, rising temperatures and variability in the seasonality of rainfall. 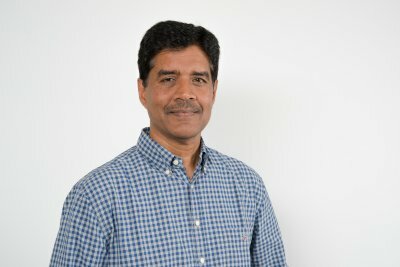 “Due to their extensive coastline and many river deltas, countries like Bangladesh and Vietnam are hot spots for climate change impacts such as sea-level rise and salt water intrusion,” says Dr Udaya Sekhar Nagothu from the Norwegian Institute of Bioeconomy Research, NIBIO. Lately, Vietnamese farmers in the Red River and Mekong deltas have been reporting increased salinity levels in their soil and irrigation waters. Photo: Trond Rafoss. 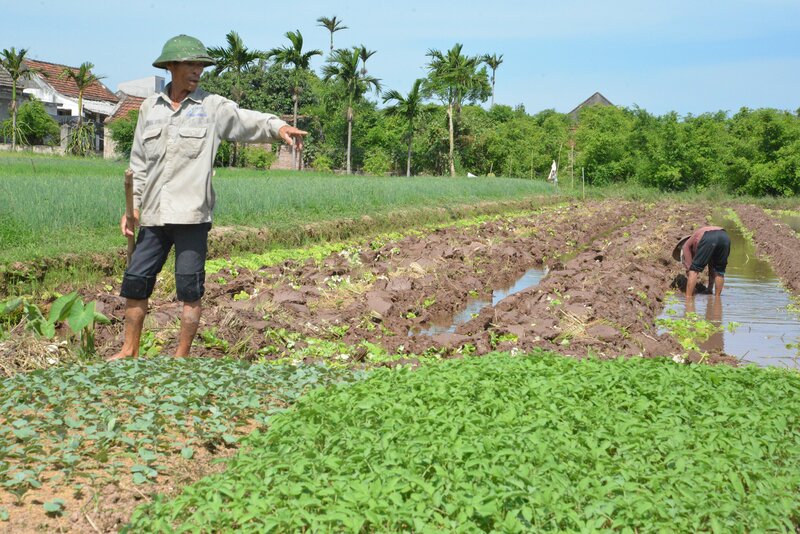 Lately, several farmers in the Mekong and Red River deltas in Vietnam, as well as local authorities, have been reporting increased salinity levels in their soil and irrigation waters. For many, this has caused damage to their properties, as well as loss of livelihoods and income. Dr Nagothu has coordinated several research projects looking at future climate change impacts on rice production in South and Southeast Asia. He says that more targeted research is needed to address salinity related problems. The development of salt-tolerant rice and crop varieties accessible to smallholder farmers is particularly important. The development of salt-tolerant rice and crop varieties accessible to smallholder farmers is a potential measure to overcome salinity related problems. Photo: Trond Rafoss. In addition to developing new rice varieties, other measures that can be carried out include the implementation of crop rotation systems, soil salinity management using raised seedbeds, and changing the date of sowing. 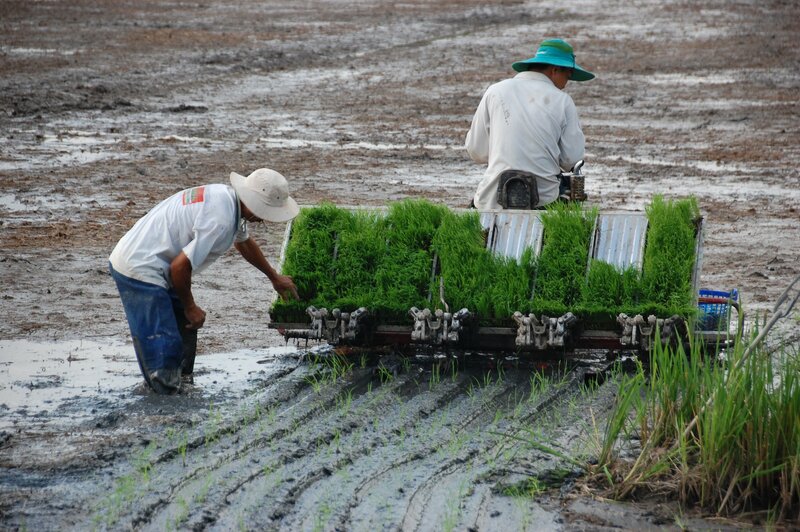 In some regions, a shift from rice production to shrimp cultivation in ponds is being taken up by farmers, as brackish water shrimp tolerates higher salt levels than most rice varieties. In the Vietnamese Red River Delta, salt water can intrude 30 to 40 kilometres inland, followed by high water levels in the riverbeds and increased sedimentation in canals and flooded plains. During the dry season, seawater moves even further inland due to lack of fresh water in the canal. As a result, paddy fields are exposed to high salinity levels in the dry season, making large tracts of productive land unfit for crop cultivation. The situation in southern Bangladesh is similar, where various measures to meet these issues have been tested. “In Bangladesh, one successful measure has been an aquifier recharge which collects fresh water during the rainy season for use in the dry season. This, in combination with improved soil management, can greatly benefit agricultural land vulnerable to salt water intrusion,” Dr Nagothu says. Through the ClimaViet project, Dr Udaya Sekhar Nagothu and his colleagues have engaged provincial authorities in a series of stakeholder workshops in order to share project results, technology options, capacity building needs and to explore investment alternatives. Farm testing of salt tolerant rice varieties under different soil and water regimes, training and raising awareness among farmers, as well as developing policy guidelines, have also been important aspects of the project. According to Dr Nagothu there is a need for an advance in science concerning new rice varieties, alternative cropping systems, physical infrastructure preventing sea-level rise and how to upscale production in line with a growing population. A more hands-on approach from local policy makers is also necessary. Although they acknowledge the issues at hand, adequate funding is rarely provided for research on the development and upscaling of salinity management measures.